1. You’re in the middle seat, between two strangers. Who gets the armrests? 2. A tall man sits down and his knees jut out wide, encroaching on your space. 3. You’re in the window seat and two strangers in the middle and aisle seats are asleep. You have to go to the bathroom. 4. On a long flight on a full plane, some kids are getting restless, speaking loudly, and kicking seatbacks. 5. Your seatmate brings a smelly meal on board and loudly starts munching. 6. 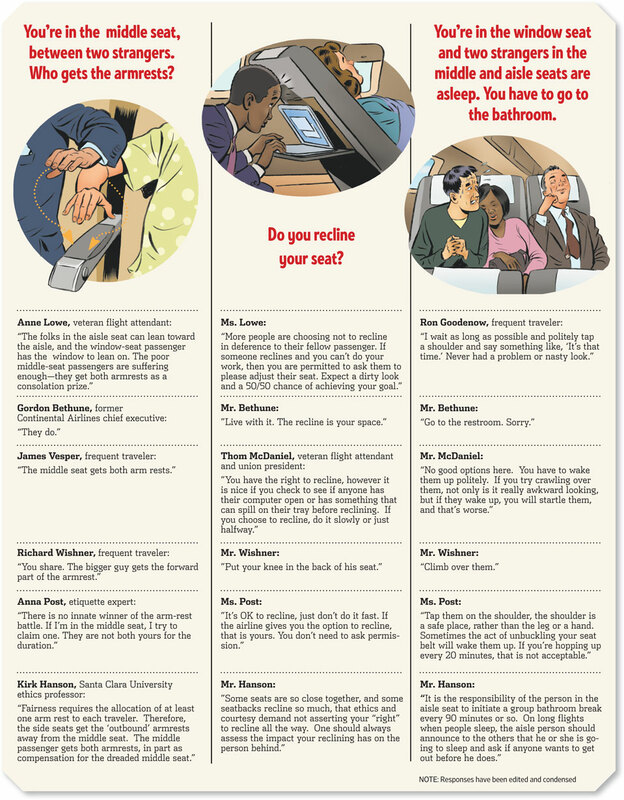 Do you recline your seat? Assorted experts offer responses, from which we discover, as experience already suggests, that we are far from consensus on how these situations should be handled, besides the obvious approach of not flying. As for the last question, I’d go with one of the experts, frequent traveler Richard Wishner, whose solution is to “Put your knee in the back of his seat.” Alas, I’ve found this to be better in conception than in execution. Maybe my knees aren’t strong enough.